← It’s Prolly Because North Carolina Is So Far Away From D.C.
Peter Sinclair Gets The Warmist Scumbag Liar Of The Month Award!!!!!! Good heavens!!! I already knew there were no depths to the depravity of the warmist scumbags, I just didn’t think they’d be so blatant about it. I did, though, expect their norm of blatant stupidity. I picked this up from Steve’s. So, jackass Petey Sinclair decides to slur one of the most distinguished scientists we’ve known during our lifetime, Richard Lindzen. He’s retiring from MIT. This piece is probably nothing more than click bait, mostly because no one cares about the warmista anymore. But, his idiotic slurring is here. Scurrillous and unkind rumors have it that Lindzen’s health is poor, related to his long time smoking habit – which he always insisted was not nearly so dangerous as all those crazy doctors said. Really? He’s always insisted smoking wasn’t as dangerous as all those crazy doctors? He’s always done so? Always? Did he ever? I don’t know the answer to that question because I’m a rational being who doesn’t obsess over what people do unrelated to the subject at hand, but, I’ve never seen a quote from Lindzen regarding smoking. I would note, regarding his retirement, and his health, THE MAN IS 74 YEARS OLD!!!! Yeh, it’s probably time for him to take some time and relax for a bit. But, that’s besides the point. What Sinclair was doing was adding some ad homs to set the table for his laughable stupidity. After referencing other imbeciles, Sinclair starts in on his “refutation” of parts of Lindzen’s career. He brings up the Iris Hypothesis …..
• Changes in water vapor will dampen global warming (also known as Lindzen’s “Iris hypothesis”)? Refuted by four peer-reviewed studies within a year of the publication of Lindzen’s hypothesis. Measurements show that the amount of water vapor in the atmosphere is increasing as mainstream climate scientists expect, and as a greenhouse gas, is amplifying global warming. LMAO!!! Well, the papers may have attempted to refute Lindzen, but, even the precious “observed” temperature readings of GISS has bore him out to be correct. Briefly, Lindzen, and others, hypothesized that there’s a compensating mechanism which mitigates warming by increasing the cloud coverage. In spite of his link to the SS site, he’s show to be correct. One year after publishing the Iris paper, here’s what the temps have been according to GISS …. Yeh, Petey, tell us how wrong Lindzen was. Tell us about all the papers which rushed to rebut. 12 years later, what does the data tell us? Sinclair then goes on to more idiocy babbling about how it’s the warmest it’s been in 11,000 years, conflates and gives credence to separate issues not related to what Lindzen was talking about and demonstrates he has no understanding of scale and resolution. He thinks he can attach a graph at 1 or 5 year resolution to a graph at hundreds of years resolution and believe it’s appropriate. And he’s babbling about how wrong a scientist can be. He doesn’t even understand basic math principles!!!! But, the most egregious example of his slanderous and, truthfully, abject mental deficiency is the graph he uses in his laughable attempt to refute Lindzen , which Steve highlighted in his post. No, really, he did that. And, yes, for the curious, the “observed” temps? That’s GISS, or NASA as others would call it. Here’s the subtext under the graph….. 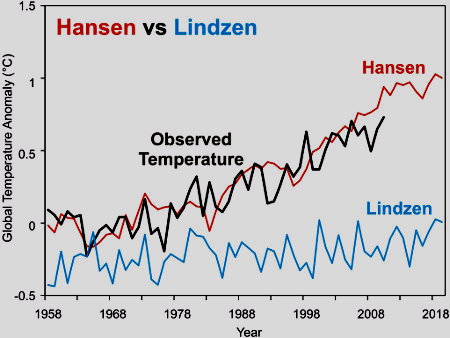 Comparison of the observed NASA temperature record (black) with temperature predictions from Dr. James Hansen’s 1988 modeling study (red), and with my reconstructed temperature prediction by Dr. Richard Lindzen based on statements from his talk at MIT in 1989 (blue). Hansen’s Scenario B projection has been adjusted to reflect the actual observed greenhouse gas concentrations since 1988. There’s so much wrong with this, I can’t really see much that’s right! Sinclair didn’t really link to Lindzen’s talk, but, to a synopsis. You can find it here. Now, read through that and see if there’s any justification for the idiotic blue line he drew. But, then, again, there’s much more that’s wrong. As Steve points out, he didn’t normalize the line he attributes to Lindzen. How he comes to the notion that Lindzen in 1989 predicted what the temps were 30 years prior, I’ve no idea. But, then that doesn’t even come close to his stupidity with the crap about Hansen. And, yes, I’m being very charitable by only calling it stupidity, because if I thought he had any knowledge and ability to understand even the most base of concepts, I would attack his character much more savagely. Hansen’s 1988 model didn’t backcast!!!! It was the training period!!! The discrepancy is the fact that the lunatics have continued to alter historical records!!! If Petey doesn’t know this, the, he has no business even typing the words “climate science” much less discussing it. But, the stupidity doesn’t end there. Sinclair is using a Hansen work product to try to demonstrate how right Hansen was. Which brings me to a finer point which I’m certain he won’t come close to grasping. 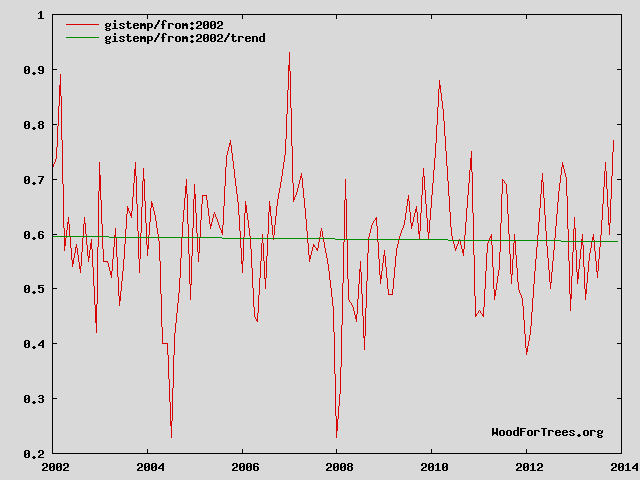 GISS global temperatures are not observed temperatures they are modeled. Again, the work product of Jimmy Hansen. There’s much, much more wrong with Sinclair’s stupidity, but, I’ve got to run for a bit. For those familiar with the temperature records and Richard Lindzen and Jim Hansen and all the other bits of idiocy Sinclair touched upon. Please feel free to freely comment. Be back in a bit! 21 Responses to Peter Sinclair Gets The Warmist Scumbag Liar Of The Month Award!!!!!! It was Lindzen who said he does not accept the model results as evidence because trusting them “is like trusting a[n] ouija board.” He has continually taken the position that models lack too many physical processes to be useful. So, why is Sinclair attributing the blue line prediction to Lindzen, who is a chief critic of model predictive skills? There’s too many problems with the maths in Sinclair’s hit piece to even begin nor would I want to waste productive time suffering a fool. It’s all Dana’s work, not Sinclair’s. Peter’s biggest mistake is to trust the likes of Dana. And so it begins. They have to lie as that is all they have left. And sadly, some idiots will buy it. abc aus will be running with it. any mass stupid seems to get them off n running fast. never an apology either when found in error. Oz, sorry about the wait in moderation. And, sorry about your ABC running on that massive bit of stupidity. You’re approved for comments now, so you don’t have to wait in moderation any more. ….. Welcome! I’ll try one last time. Sinclair doesn’t look to me like a “warmist scumbag liar”. He appears to be the one warmist blogger who has understood that blocking all dissenting voice is a form of intellectual masturbation and just as prolific. For some reason Sinclair sees things from a warmist perspective and in his mind Dana is a good guy who puts graphs together, instead of a paid employee of an energy company who Dana managed never to hurt in his writings, and a fabricator of fake graphs. The title of this blog is therefore inappropriate. It’s Dana all the way down. Sinclair also missed the connection between Dana and SkS, the revelation of the SkS secret forum where they conspired to attack skeptic blogs (I witnessed such an SkS tag team attack for a few weeks at Notrickszone – Rob and Dana – didn’t know at the time that both were SkS secret forum members); Sinclair missed John Cook’s and collaborators conspiracy about exactly how to rate those abstracts to arrive at the desired 97%) etc etc etc… Sure yeah, he was so busy he missed all that… the poor innocent soul. Oh, and he is so polite to call his neverending magnus opus “Climate Denial Crock of the Week”. So, not a stranger to the fighting slogans and holocaust denier assossiation agitprop of the totalitarian warmist movement. You really like that guy? Scumbag is the least one can call him if you ask me. Omn, maybe you’re more familiar with Sinclair than I am. You’re right, I attributed too much to Sinclair. I’ve read his post and re-read mine in response to your comment. I can, and do see where you’re coming from. I was going to correct my post. You’re right. This is the work of Dana. OTOH, not only did Peter reproduce it. He felt compelled to add some unsubstantiated crap about Lindzen and smoking. Indeed, look at the pic he led with. The implications, to me, are clear. And, they should be to you. 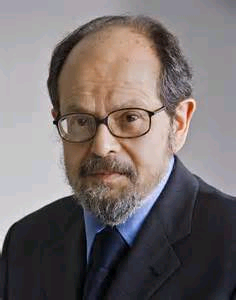 The statement is, ‘Lindzen is a smoker. He’s wrong about that, ergo, he’s wrong about climate science. Sinclair is worse than Dana. He compiles more asinine stupidity and then endorse the lying scumbaggery of Dana. As far as I’m concerned, Sinclair is worse than Dana. I believe he’s displayed a certain sort of cowardice on top of an unfathomable ignorance and stupidity. All the while hiding behind imbecilic crap which he was too stupid to come up with himself, but would endorse it, without explicitly endorsing it. Mimicking intellectual vacancy is no excuse for spewing moral vacancy. I also find Monckton’s piece a distraction – the point is that Honest Dana has written a psychotic commentary about two fabricated predictions, neither of which attributable to Hansen or Lindzen. Sinclair makes it his cause. That doesn’t make him a scumbag liar of the month…otherwise there’d be hundreds of them!! Is insanity a defense against libel in the UK? Climate scientific Tourette’s might work. Well, true, there are multiple scumbag liars of the month.